With a voice that “shimmers,” (DC Metro Theater Arts), Washington, D.C.-based soprano Amy Nicole Broadbent has garnered recognition as a versatile and dynamic performer. Her previous solo concert work has included: Mozart’s Requiem, Brahms’ Requiem, Handel’s Messiah, Barber’s Knoxville: Summer of 1915, Poulenc’s Mass in G, Pergolesi’s Stabat Mater, Bach’s Christmas Oratorio, Haydn’s Creation, Bach’s Magnificat, Britten’s Rejoice in the Lamb, Howells’ Requiem, Bach’s Coffee Cantata, Arvo Pärt’s Passio, Reich’s Tehillim, Bach’s solo cantata Ich bin in mir vergnügt, and numerous sacred Bach cantatas. An advocate for new music, in 2016, Broadbent was selected by composer Robert Kyr as a soloist for the world premiere of his cantata Song of the Beloved. She has also premiered solo works by James Levy, Joel Pierson, Alexandra Bryant, William Kenlon, and Geoff Sheil. Her operatic credits include: Pamina & Papagena (Die Zauberflöte), Josephine (HMS Pinafore), Elsie (The Yeomen of the Guard), Johanna (Sweeney Todd), and Ms. Jessel (The Turn of the Screw). Professional achievements include winning first-place in the 2015 National Society of Arts and Letters’ Winston Voice Competition, after which Ms. Broadbent used the scholarship to study in Weimar, Germany, appearing as Pamina in Mozart’s Die Zauberflöte. 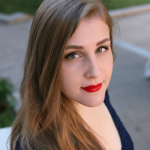 She recently won first place at local and regional levels of NATS competitions, and was a prizewinner for the New York Oratorio Society Competition at Carnegie Hall, the Annapolis Opera Competition, the Bethlehem Bach Competition, and the Franco-American Grand Concours Vocal Competition. As an ensemble musician, Amy has performed with many of the nation’s top professional choirs including the Santa Fe Desert Chorale, The Crossing, True Concord Voices & Orchestra, the Berwick Chorus of the Oregon Bach Festival, the Choir of the Basilica, the Choir of Trinity Wall Street, Cathedra, the Washington Bach Consort, the Thirteen, and the Washington National Cathedral Choir. She is currently a vocalist in the United States Navy Band Sea Chanters Chorus, with the rank of Musician First Class. Amy holds degrees from the University of Maryland, College Park.